I’ve always been a HUGE fan of eggs — almost any type of eggs. In general, I guess our family loves most breakfast foods, which is why we have breakfast for dinner about once a week. In addition to my love of eggs and breakfast foods, I eat a MASSIVE amount of hard boiled eggs — like sometimes more than one per day! Since I love eggs, hard boiled eggs seem to be the perfect snack choice when I’m rushed. They require no prep-work (except peeling them) they are healthy, protein-packed, low/no sugar, and they can easily be prepared ahead of time and stored in the fridge for several days. For years, I actually boiled my hard boiled eggs… until I came across this post from my blogging friend Tara of Unsophisticook (and Deal Seeking Mom). 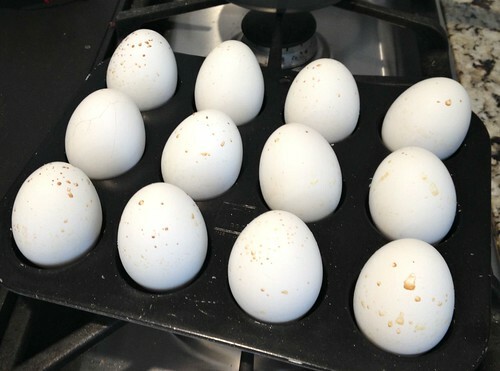 She BAKED her hard ‘boiled’ eggs in the oven and they came out perfectly every single time! I can remember the day I read that post over 2 years ago, I immediately grabbed my mini muffin tin and a handful of eggs to give it a try. 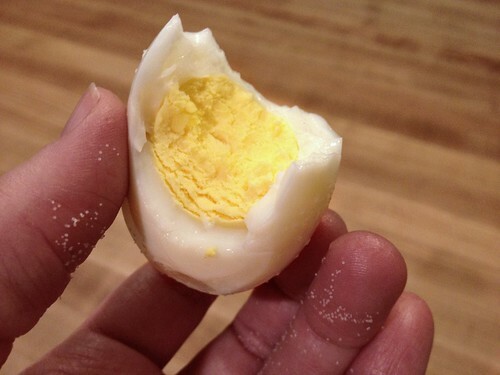 To my amazement, it worked marvelously — and I’ve been baking my hard boiled eggs ever since. So with Easter right around the corner and more people looking to hard boil eggs, I thought it would be a perfect time to share this SUPER SIMPLE recipe on my blog — since I’ve been using it for over 2 years now! 1. Don’t try to bake anything else in the oven with the eggs as then the 30-minute time frame won’t be accurate (even if you’re using a convection oven — I know from experience!) so you’ll be left guessing how long to leave them in. I can almost guarantee that you’ll end up under or over-cooking them so it’s just not worth it in my opinion! 2. Use eggs that are at least 1-2 weeks “old” as they will be MUCH easier to peel (I promise!) 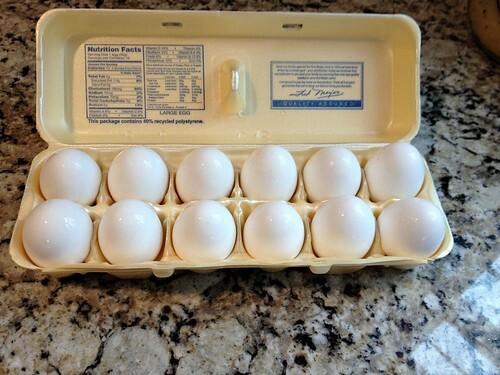 I usually buy a couple dozen eggs each week and save one dozen for hard boiled eggs. I actually write “for hard boiled” on the carton, and then keep them in the back of the fridge for at least a week. Once I boil them, I put them back in that carton and cross out the “for” so it just says “hard boiled”. 3. The egg shells will usually have brown spots all over them when they come out of the oven — this is normal and nothing to be concerned about. The spots usually wash right off in the ice bath, but even if they don’t, I wouldn’t worry too much. 5. I wouldn’t peel the eggs until you are ready to eat them — you’re entire refrigerator will smell like hard boiled eggs otherwise. Plus, the shells will keep the eggs fresher for longer. Oh, and if you’re looking for a really yummy way to use up some of your hard boiled eggs, slice them up and put them on this layered lettuce salad. How do you cook your hard boiled eggs? The simplest way for me to hard boil eggs is just like momma did it. Put eggs in pan, fill with water to cover (no salt), bring water to rolling boil. Take pan off heat and put cover on pan. Let sit for 10 minutes. Drain off water and cool eggs down by running pan full of cold water. Let sit 5 minutes then drain and put eggs in refrigerator until cold. Perfectly boiled, perfectly cooked and they peel so easy with no little bits of shell breaking off. I might have to try your method too — everyone always has their favorite ways! That’s my method as well. So easy and never over cooked. Love this! I did it last week and it worked just like you said. I am doing my second batch today! Thanks Andrea! So sad. I followed recipe moor the hard boiled eggs in oven…to a T. Not done. you’ll probably want to check the temperature of your oven using an oven thermometer. There’s a good chance your oven temp is actually lower than what it’s set at. Definitely easier than the boiling method, but our brown spots didn’t come off in the ice bath, or even when I rubbed them dry. No big deal if you’re just going to peel and eat, but we used them to dye Easter eggs and the brown spots do still show thru the lighter dye colors. hmmm… that’s weird. I’ve never had any issues with the brown spot not coming off. Try putting eggs in your rice cooker. Put about a cup of water and salt with it! interesting! There are so many different things you can do with a rice cooker — I should do a post on that! Hi there – when you say “mini-muffin tin” – what exactly do you mean? I went to go purchase one on Amazon but all the “mini muffin” pans have 24 cups and the regular muffin pans have 12 cups. It looks like the pan in the photo only has 12 cups? Thanks in advance, I know it seems like an inane question. Hi Melissa, I’m honestly not sure how to ‘explain’ a mini muffin tin – it’s just like a normal muffin tin… but smaller. Regular muffing cups would work too — I just use the mini muffin tins because I have them on hand. We steam our eggs and I swear by this method. My daughters won’t eat sandwiches, so they have been a go to for protein in their lunches. 2 cups of cold water with a steamer tray on the stove top. Turn the burner on and put a lid on and 17 minutes start to finish. Always perfectly cooked with a yellow yolk. The best part? The peel slides off every time. A MUST for deviled eggs. A different way for sure…. United States treats eggs differently than any other country. Most other countries don’t need to refrigerate their eggs. Right after the eggs pop out of the chicken, US requires them shampooed and cleaned, which compromises their natural integrity. They’re “clean” but no longer have the natural preserving residue other countries leave alone. That’s why our eggs make us sick while other countries can leave them out just fine. This is very interesting — thanks for sharing! Fill large pot with water, put eggs in water (we usually hard boil 18 at a time), bring water to boil on stove. Once water has boiled turn off the heat and move pot to a cool burner & put iid on for 20 minutes. After the 20 minutes, dump out the hot water and run cool water over eggs in pot for about a minute (until eggs are cool to the touch), then transfer eggs to carton in the fridge. The trick I’ve used for easier to peel eggs is to crack the egg a couple of times, then to roll it around on a hard surface before peeling. Wow, never heard of the oven method. Can I ask how you normally boil eggs and why this way is easier? Is it just easier if you cook a lot? I ask because the way I cook them is far quicker than the oven version and fairly foolproof. I’m relieved to hear they can last 2 weeks as I thought they would go off after 5 days or so, so always hurried to eat them! I put mine in a saucepan, fill it with boiling water until it covers the eggs. I put the hob on high, #6, wait until it really boils away then turn it down to #4, and aet the oven timer for 10 mins. When it beeps I turn the hob off, tip the water in the sink, add cold water, leave eggs a little while, then take them out, let them cool down then stick them in the fridge. OMG, what an idea! I’ve never heard this idea about making it in the oven… I must try it soon. Eggs are so good for you too when you are pregnant and nursing. That’s when I crave them the most. yes, you’ll definitely need to try it again — and maybe this time, use an oven thermometer to test the temperature of your oven first. You’d be surprised how much oven temps can vary! Tip: If you want to do this with fresh eggs leave them on the counter til they reach room temperature. They will be very easy to peel. I too LOVE hardboiled eggs. It’s pretty much the only way I eat them. We have chickens so we have an endless supply. wow — thanks for the tip Lydia! 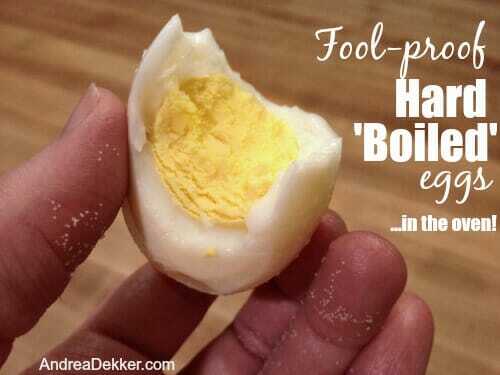 I’ll definitely use this the next time I “bake” my hard boiled eggs. I had a ROUGH time peeling some a while back and half the egg whites came off with the shells! I actually own an egg cooker thanks to a well-meaning in-law who gave me one at my bridal shower. It hard boils 7 eggs at a time. Just put the eggs in, add water (from provided measuring cup) and turn it on. It beeps about 20 minutes later – just long enough for me to forget I was making eggs. I probably wouldn’t buy one for myself, but since it was a gift it does get a decent amount of use. This posted reminded me that my 3yo picked all the egg out of a potato salad and I decided to make egg salad for her…. haha — gotta love those random small kitchen appliances:) Glad you’re making use out of your egg cooker! You mentioned that you usually do a dozen at a time, but less should be OK. Given your warning not to bake anything else with the eggs, would you adjust the cook time for fewer eggs? It should be fine — as long as your oven temperature is consistent and accurate (you can check with an oven thermometer to make sure). 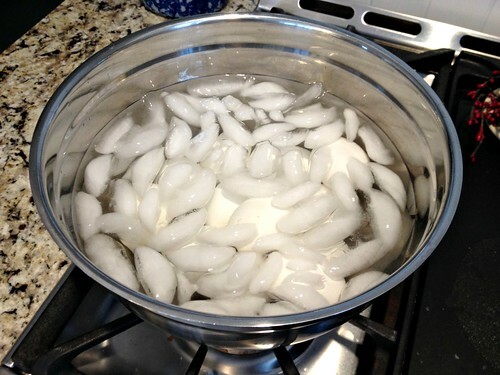 I’ve personally don everything from 6 eggs to 24 eggs at a time without issues using this exact recipe. The yolk doesn’t look all crazy either, which is nice – sometimes with boiling they can come out with a weird greyish-greenish tinge if you leave them go too long.